The accuracy of conventional dose algorithms for radiosurgery treatment planning is limited, due to the inadequate consideration of the lateral radiation transport and the difficulty of acquiring accurate dosimetric data for very small beams. In the present paper, some initial work on the application of Monte Carlo method in radiation treatment planning in general, and in radiosurgery treatment planning in particular, has been presented. Two OMEGA Monte Carlo codes, Bf3M and DOSXM, are used. The BEAM code is used to simulate the transport of particles in the linac treatment head and radiosurgery collimator. A phase space file is obtained from the BEAM simulation for each collimator size. 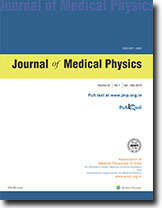 The DOSXYZ code is used to calculate the dose distribution in the patient's body reconstructed from CT slices using the phase space file as input The accuracy of OMEGA Monte Carlo simulation for radiosurgery dose calculation is verified by comparing the calculated and measured basic dosimetric data for several radiosurgery beams and a 4 x 4 crn2 conventional beam. The dose distributions for three clinical cases are calculated using OMEGA codes as the dose engine for an in-house developed radiosurgery treatment planning system. The verification using basic dosimetric data and the dose calculation for clinical cases demonstrate the feasibility of applying OMEGA Monte Carlo code system to radiosurgery treatment planning. Dosimetric data are collected for 4, 6 and 10 MV photon beams of small circular fields of 12.5,20, 30 and 40 mm diameters. Tissue Maximum Ratios (TMR) are measured in a mini 6-inch diamater cylindrical water phantom and in a 25 x 25 cm2 polystyrene phantom using 0.02 cc ionization chamber. Output factors (OPF) are measured in polystyrene phantom using ionization chamber, films, TLDs and MOSFET (Metal Oxide Field Emission Transistor) detector. Profiles are measured using films at 10 cm depth. The location of TMR dm= depth, shifts by 1 mm as the field size increases from 12.5 to 40 mm diameters for 4 MV beam, whereas it shifts by 3 and 6 mm, respectively, for 6 and 10 MV beams as the field size increases. The output factors measured with ionization chamber are in better agreement with those measured with films even at 12.5 mm dia field size for 4 MV photon beam than those for 6 and 10 MV beams. The profiles of 4 MV beam are in better conformity with the expected field shapes than those of 6 MV beam, and in tum, 6 MV beam profiles are better than those of 10 MV beam, particularly in the region of shoulders. The estimated 80% isodose volumes for 1 to 10 non-coplanar converging arcs of 4 MV beam for a typical 20 mm diameter field size are slightly larger than those of 6 and 10 MV beams. The isodose volume decreases as the number of arcs increases and then remains, more or less, the same. On the whole, it is noticed that the measured dosimetric data of 4 MV beam give less uncertainty in dose calculations and in delivery to the exact tumor size for routine radiosurgery. Tissue compensating filters are used in radiotherapy to correct for the dose inhomogeneity produced in the irradiated volume due to irregular body contour. This paper describes the nonuniformity of the doses within the target volume without any tissue compensatior filter, manually designed compensating filter and the computer " designed compensating filter. The dose inhomogeneities produced without any Compensator, manually constructed aluminium compensator and computer designed compensating filter were compared and evaluated. The results show that dose variation can be as high as 30% without any compensating filter. This inhomageneity. Can be reduced to k 13% with the use of manually designed compensating filter constructed with aluminium blocks. The uniformity is further improved with the use of computer designed compensaing filter, where the dose ' variation inside the target volume would be within clinically desirable levels of * 3%. Such individually made compensators have added advantages like less preparation time and enhanced accuracy. To achieve therapeutic gain, unconventional dose per fraction has been employed in radiotherapy, in addition to the conventional dose per fraction of 2 Gy. Dose Fractionation Factor (DFF) and Therapeutic Gain Factor VGF) have been utilised to test the efficiency of such unconventional fractionation schedules. In this study, isoeffective dose for 100% tumour regression and mucossal and skin reactions were estimated. CUE, TDF and ERD values for tumour and normal tissue reactions were evaluated. DEF and TGF values have been determined on the basis of dose, CRE, TDF and ERD, in order to understand the influence of these bioeffect models and stage of cancer on TGF associated with differing fractionation schedules. There was a noticeable difference in TGF values determined on the basis of four criteria, which is in agreement with radiobiological phenomenon; that tissues with different alp values differ in their responsiveness. This study is aimed to provide an appropriate extension of recently proposed many component (MC) model to address the issue of proliferation which occurs during and after irradiation in different kinds of tissues and tumours. The proliferation is an essential and important feature of early-reacting tissues and tumours which alters the treatment recommendations. . The original MC model is unable to explain the effect of proliferation in the absence of a correction factor. Therefore, a proliferation correction factor, in terms of a time factor, is incorporated into the expression of survival fraction of MC model using an assumption that the proliferating cells grow exponentially and hence there will be an exponential increment in the survival fraction during the interval period between successive fractions. The final expression of the survival fraction is S - exp [-aDexp (bd) + (0.693 / Tp) (T-Td)], where notations are having their usual meanings. The expressions of effect, E - 1 -exp [-aDexp (bd) + (0.693 / Tp) (T-Td)] and biologically responsive dose, BRD - Dexp (bd)- (0.6931a Tp) (T-Td), are very important equations of MC model. The BRD equation is applied to compare some of the currently used radiotherapy schedules. The results of the study indicate that for fast proliferating tumours, the Manchester schedules would be more effective to get good response and tumor control among the analyzed schedules but would lead to more early and late tissue damage. Depth dose measurements were performed using a p-type semiconductor detector in water at nominal electron energies of 6,9,12, 16 and 20 MeV for the standard available square field sizes. The range and energy parameters were derived from the central axis depth dose measurements. The virtual SSD and the penumbra were measured from dose profiles obtained in planes perpendicular to the beam central axis in water.